... with the FANG block down on the day, but the biggest victims are chip stocks, which are getting crushed after a pair of downgrades by both Goldman and Stifel, which threw in the towel on a variety of names both large and small in the computer memory space, traditionally an advance proxy for the state of the Chinese economy which as we discussed over the weekend is set for a lot of pain as a result of the collapsing credit impulse. Telecom stocks were also among Wednesday’s worst performers. One of the names hit the most has been former hedge fund darling Micron, the worst performing stock in the S&P, which is down another 6% today to $41, and a whopping 37% from its $64.66 highs set in late May. 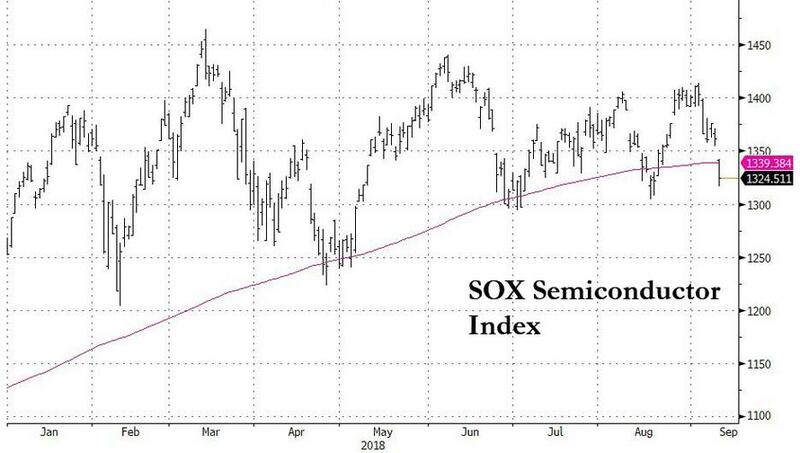 The downgrades sent the has the SOX index tumbling as much as 3%, among the worst sector decliners in the early going, and also pushing the index below its 200DMA. 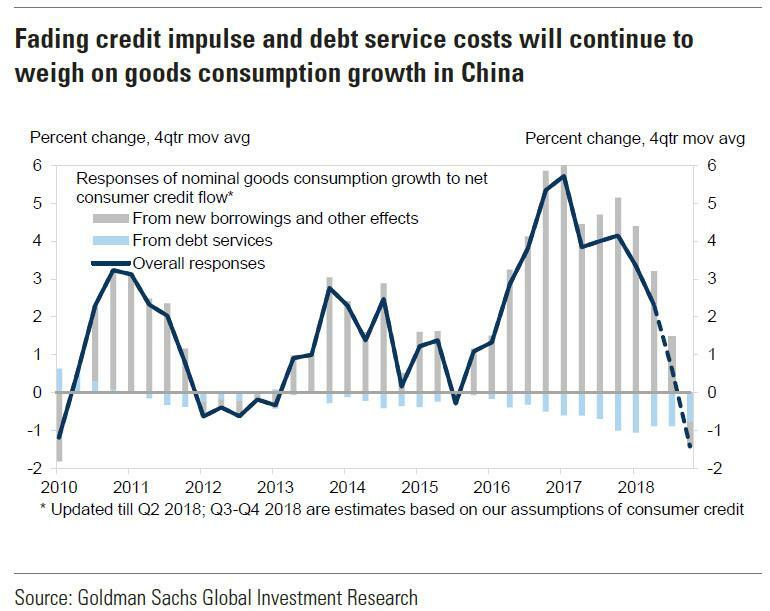 Semis are "a key indicator for the broader technology sector, and for the general stock market going forward," Miller Tabak's said. "If the semis do indeed break-down from here as we move through the rest of September, it could/should lead to investors to rotate away from the tech stocks in a more meaningful fashion than they did last week." Not everyone is convinced a breakdown is imminent however: Bloomberg's Andrew Cinko notes that the SOX remains stuck in the sideways range writes that "the reason the SOX's range-bound trading continues is that the companies with the most influence on the index are in bull mode this year and some of them (QCOM, TSM, AMD) are outperforming the index today." 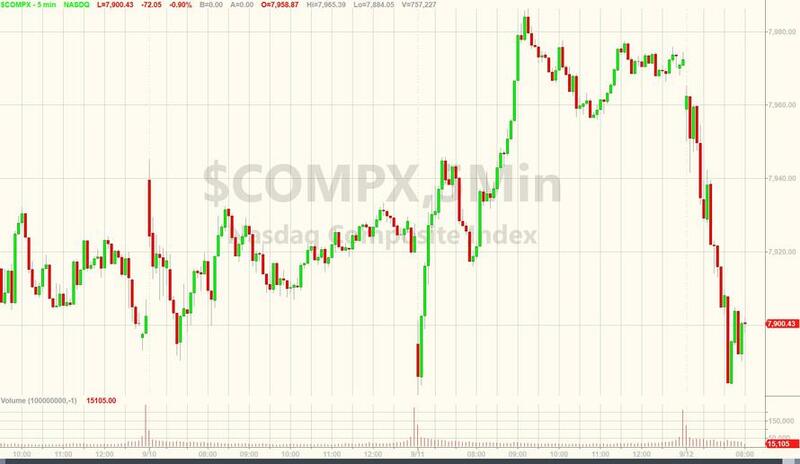 As Cinko adds, to knock the index down substantially, QCOM, NVDA, TXN and AMD are going to have to take substantial hits. Until that happens, the SOX's weightings, combined with the individual stock performance, suggest this closely-watched sector will continue to churn. Elsewhere, in addition to the slump in the information technology and financial sectors, which are the biggest losers in the S&P 500, energy companies and miners are among the biggest winners in the Stoxx Europe 600 Index as the Bloomberg’s Commodity Index rose. Meanwhile, as noted earlier, the MSCI Asia Pacific Index was on course for a 10th consecutive decline, the longest losing streak since 2002. Finally, following today's unexpectedly weak PPI print, which showed the first monthly decline in 18 months, Treasury yields eased and the dollar turned down, helping crude oil surge.